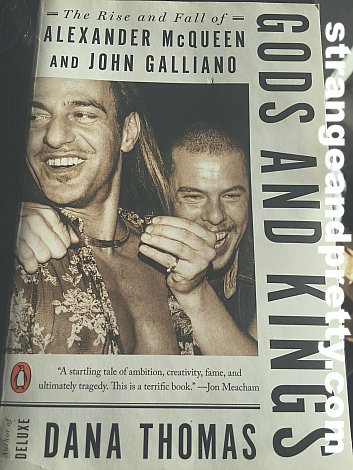 Strange And Pretty: Current Read: Gods And Kings By Dana Thomas. Current Read: Gods And Kings By Dana Thomas. I purchased this book a while ago, and I put off reading it because I thought it'd depress me. Ever since I went to see the Savage Beauty exhibit a few years ago, I loved Alexander McQueen mind and creativity. So I figured I should read up on him a bit. I'm not one that's deep into fashion (fabrics, silhouettes, sewing, etc), and this book has a lot of technical fashion phrases that I'm not familiar with. I'm totally okay with that. It's helping me learn, even though I'm not in the fashion industry and don't plan to be. I've only read a little of it so far, but as of now I'm liking it. It's giving me a peak into how the fashion world was back in the day, and how it is now.